Freezing cold toes are no fun when you are out for a ride. These boa snowmobile boots will protect your little piggies when the mercury drops. No one likes to get cold feet, especially when snowmobiling, and maybe when getting married. 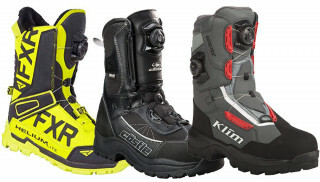 Picking the right pair of boots is vital to the enjoyment of the ride. Not only do you need warm boots, but also supportive boots that function just as well off the sled as they do on. 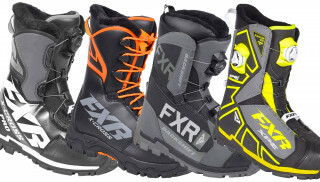 Here are five boa snowmobile boots for the 2018/2019 snowmobiling season that pass the test of being warm, functional, comfortable and ready to take on the adventure that you have in mind. Boa technology is something you’ll see with many of the top boots. It is a simple system that has replaced standard tie-laces and lets you really get a snug and secure fit. 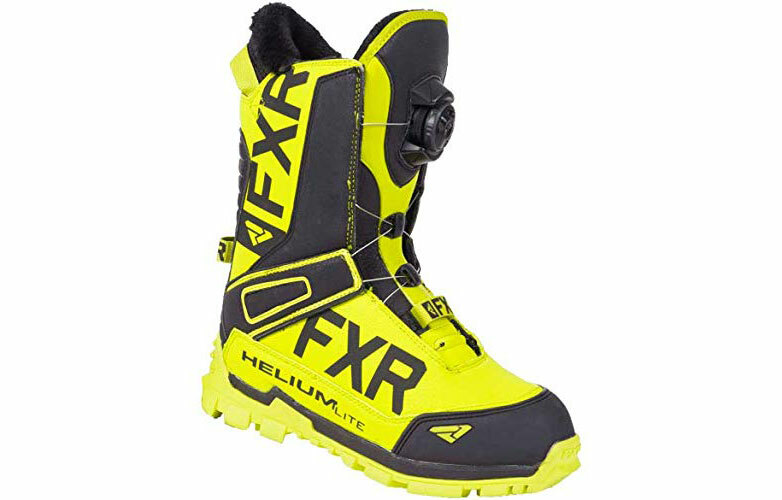 FXR Racing created the Helium Lite boot for those wanting the ultimate in extreme terrain riding and warmth. They are rated to -60-degrees C with 800-gram insulation, but there’s so much more to these boots. I got a pair for my wife and she first thought they fit like a ski boot when she tried them on. It’s when you get on the sled and take off that you truly appreciate the design. 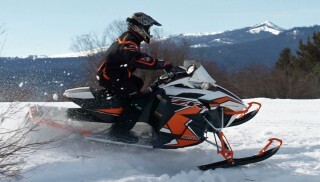 It moves with you, giving you a better feel for how the sled is tackling the terrain. They are great for mountain riding as well as trail riding and have thick EVC padding, 20mm, for absorbing impacts to the sole. Castle comes in with yet another Boa-style boot, the Charge. These boots have a wicking layer to help transport moisture away from your foot so you stay warmer and dry, something that is important when the mercury drops. They’re rated for -60F with a three-layer Merino Wool blend insulation that provides amazing warmth. These boots are also completely waterproof on the outside with Castle’s DRY-X technology that seals in the 1000D nylon outer shell material. 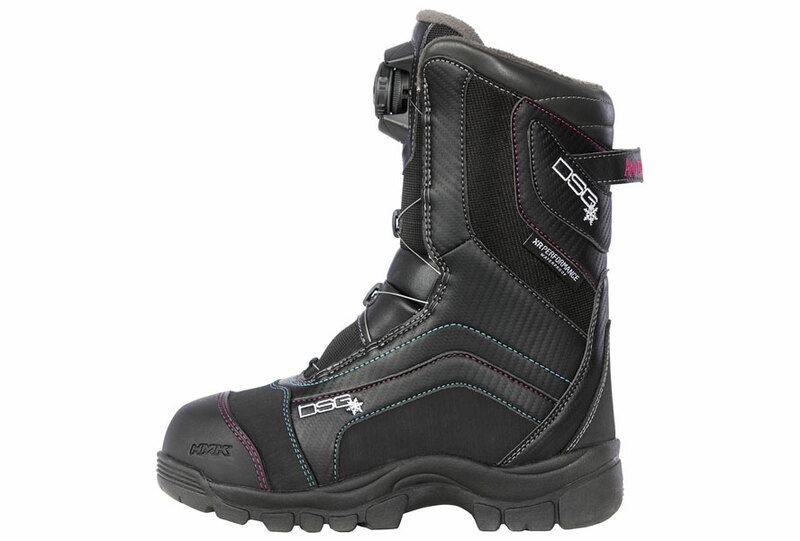 These boa snowmobile boots have a high ankle design to help keep the snow out. The price is pretty good, too. 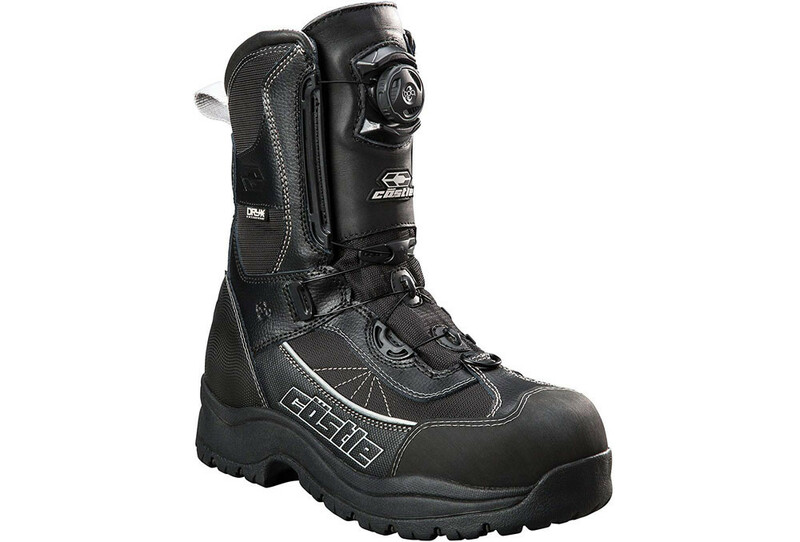 While not a traditional snowmobile boot, these brand-new boots from Irish Setter are something you should look at for a warm, dry boot that has tremendous support for activities on the sled and off. They have 400g PrimaLoft Gold ECO insulation that traps heat and keep you warm without the bulk. And of course, there’s the Boa system enclosure that is so popular. The really cool thing about these boots is how they absorb impacts and support you foot, returning energy to you as you do stuff. I have been wearing a pair for a few weeks now and have noticed that my feet don’t get tired as easily. Whether I’m walking or riding. They are 100% waterproof and have Irish Setter’s ScentBan technology, which makes them a great hunting boot, too. If you’re really active off the sled on your adventures, these are the best new boots for this season. Best of all, they come in wide sizes, which is good for Sasquatches like me. 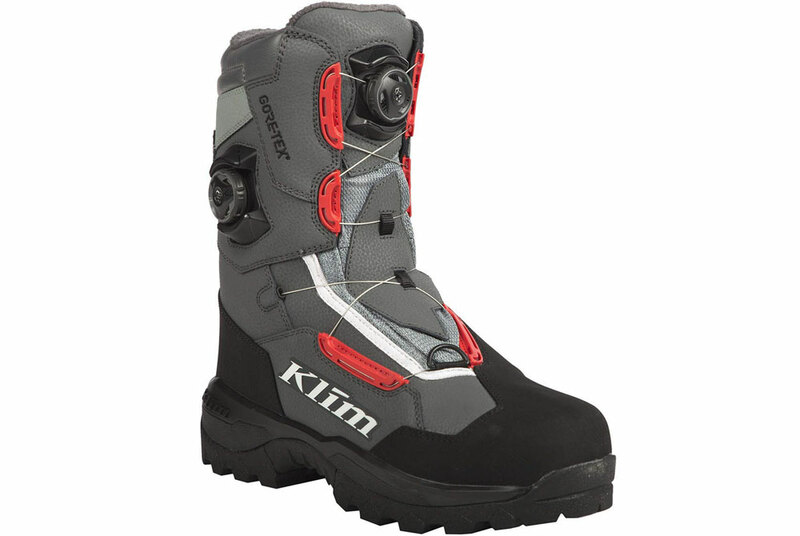 Of course, you know Klim is going to bring it when it comes to technical riding gear. The all-new Adrenaline Pro GTX boot is Klim’s latest advancement in comfortable boots made for extremely technical conditions. 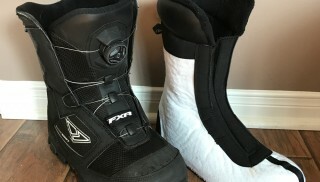 The plan going into the these boa snowmobile boots was to tweak their previous design to add more support for your foot and for you as you tackle the terrain. 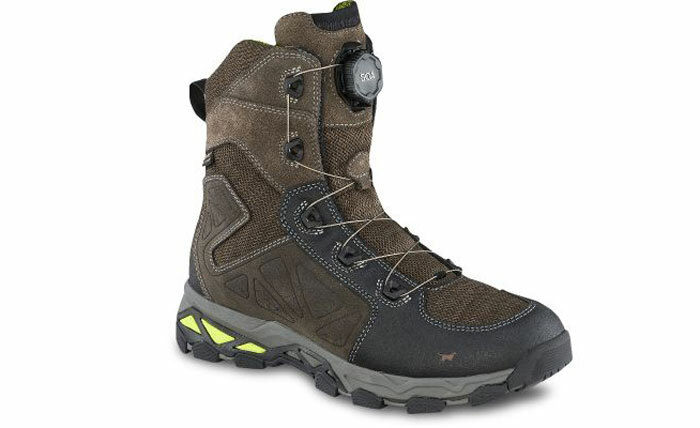 The GTX boots have an advanced Boa closure and 600g Thinsulate insulation. They are guaranteed to keep you dry with complete GORE-TEX outers. They recommend a technical sock be worn to get the most out of the boot, which isn’t a bad idea anyway. These boots also have a forward design with stiff support against movement that aren’t going forward. This helps keep you planted and protected, while at the same time, being comfortable – Just as you’d expect from Klim. There are a ton of women riding, so a boot designed specifically for a woman’s foot is in order when it comes to riding in extreme terrain, or on the trail. DSG is a women’s company with gear designed by women for women. It’s some pretty sweet stuff too. This boot will keep your toes warm, and your foot planted where it needs to be. DSG uses Intuition closed-cell memory foam insulation that takes the shape of your foot and supports it in critical areas, while having a 10-1 heat retention ratio. These boat snowmobile boots are rated to -40F and they look good, too.